At the time of release, the 2015 vintage was viewed as exceptional, the natural successor to 2009 and 2010. The in-bottle scores, which are now being published, are confirming this. Antonio Galloni has released his in-bottle scores for Bordeaux 2015, saying ‘Two thousand fifteen has turned out to be a fabulous vintage for Bordeaux’. Perrotti-Brown says ‘2015 is an extraordinary vintage’, Suckling follows suit ‘the 2015 vintage has lived up to its great potential in every sense of the word’. It is noteworthy that among the re-scored wine by Galloni, two of the leading Estates to receive a boast are Leoville Las Cases and Ducru Beaucaillou, both receiving 98 points. This puts them firmly among their greatest ever vintages. It is interesting that in Perrotti-Brown’s Wine Advocate February interim report, she did not include her bottle score for Leoville Las Cases 2015. Rather instead, planning to do so in the next couple of days. Leoville Las Cases is the wine closest to First Growth quality on the Left Bank, it is one of our absolute favourite wines. This is a Chateau that has the ability to outclass the First Growths on occasion; in 2015′s En Primeur week, the three wines that we most enjoyed tasting were Margaux, Haut Brion and Las Cases. The 2015 is absolutely stunning. As such, it was a surprise to see Neal Martin give this wine 95-97 points from barrel, we felt that despite doing a good job on the campaign, he got this one wrong. This is becoming clear with the rescores to date – Suckling increased to 98 points in bottle from his 96-97 barrel score and Antonio Galloni scoring it 98 points, the very upper limit of his 95-98 point barrel score. We are still awaiting Lisa Perrotti-Brown’s scores (to be published imminently) and Neal Martin’s bottle score. However, we expect them to be very high. As the comparison table below highlights, the 2015 is beautifully undervalued now – all other leading vintages, including the more recent 2016, trade for at least £2,000 per case and up to £2,500. 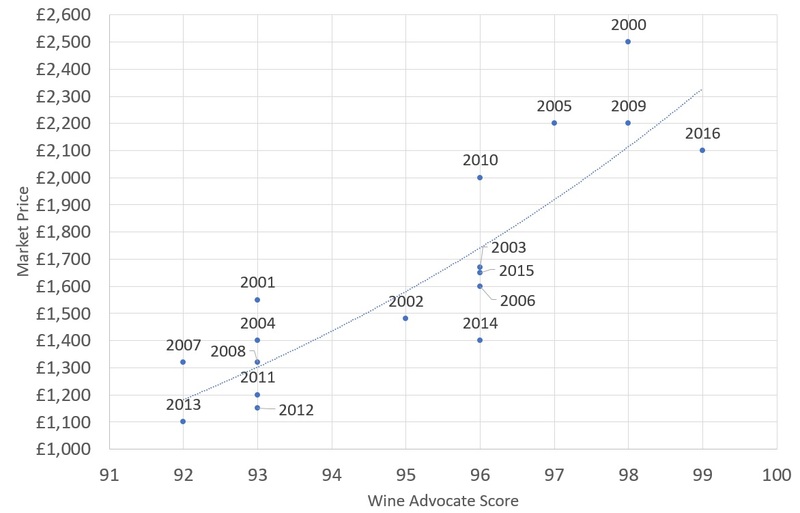 This data strongly suggests Leoville las Cases 2015 is due for a price adjustment of around 30%, which could happen almost overnight if the Wine Advocate comes out with a very high score. Even if it scores the same as the others it will quickly catch up with the other vintages over the next 12 months. This is a very sharp buy, whether looking to acquire this for the collection or turn to it around as a short-term flip, or longer-term investment hold. The average trading price of the leading vintages of Leoville Las Cases is £2,200, the 2015 priced at £1,600 looks a very strong buy indeed. The 2015 vintage of Leoville Las Cases is already shown to be undervalued when compared with other vintages. 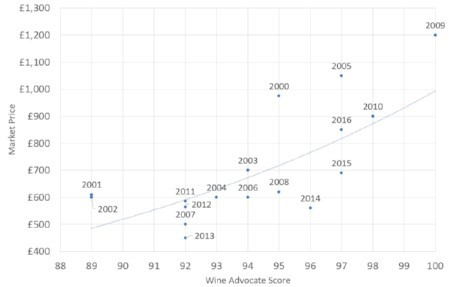 However, if we posit that the Wine Advocate’s upcoming rescore matches the 98 points awarded to the 2015 by Antonio Galloni and James Suckling, then it can be expected that the 2015 vintage’s price will rise above the trendline at £2100, possibly reaching the heights of the 2009 and 2000. Ducru Beaucaillou was originally awarded 94-96 points from Neal Martin in barrel, which with 97 points from Suckling, the Wine Spectator and 98 now from Galloni, seems rather underestimated. In her recent report Perrotti-Brown marked this up to 97 points. Galloni does not pull his punches ‘2015 Ducru-Beaucaillou is phenomenally great…The 2015 has been nothing short of sensational on the two occasions I have tasted it so far… Don’t miss it!’ As we can see from the table below, its new scores indicate that it is now undervalued compared to equivalent vintages. The average price of the other leading vintages is £1,990, as such the 2015 is trading today at a discount of 29%. When compared with past vintages, the 2015 vintage of Ducru Beaucaillou demonstrates an undervalued wine. It’s 97-point score is indicative of a market price of approximately £825, whereas the current market price of £700 is more typical of a wine scoring 94 points, the bottom end of its previous score bracket. This suggests that the market will correct itself, causing the 2015 vintages price to increase to the trendline, or exceeding it, as observed in the 2016 and 2005 vintages. These two St.Julien powerhouses are remarkable in 2015 and re trading at a large discount to their qualitative value. They will reward immensely from bottle for 50 years, they are also very strong investment wines. Aromas of oyster shell, iron and currants. Hints of iodine. Full-bodied, very tight and focused. Love the finish of sandalwood, cinnamon, violets and lavender. Wonderful tannin texture. Linear and driven. Drink in 2022.